Ramon Gonzalez, an architect from EcoSur Nicaragua, travelled around the globe to help a local initiative to plan and build a school in the mountains of Nepal. 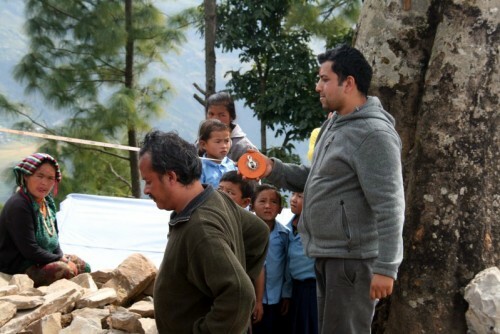 The village of Bhorle in the Langtang national park was almost completely destroyed by the earthquake last April. The German NGO “Gecotec” has asked the EcoSur network to provide a specialist to plan and build a new primary school, using local materials. Nepal measures 147,000 square kilometres, about the same size as Nicaragua, but in spite of the fact that much of it is inhospitable mountains (among them the famous Mount Everest), it has about five times more inhabitants, 27 million, and is one of the most densely populated countries of the world. Hundreds of small villages are situated on steep hillsides, only accessible on demanding mountain trails. 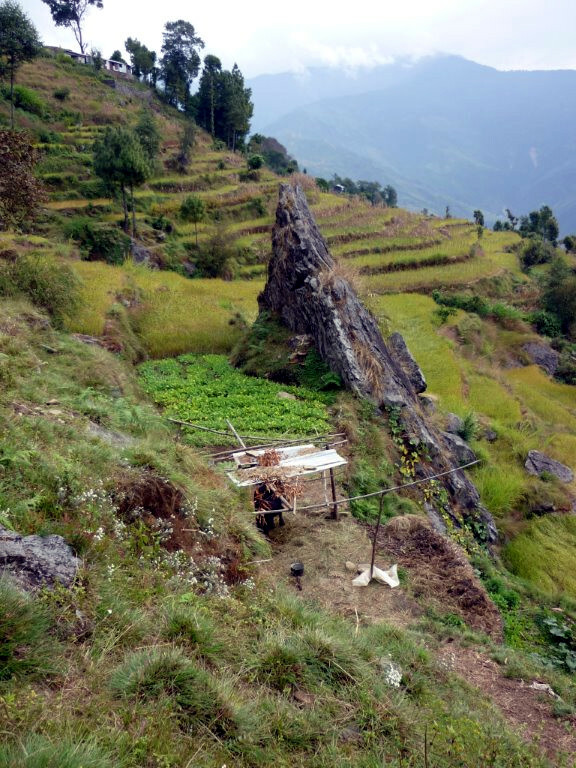 It is difficult to imagine how families can survive on the crops they grow on the small terraces carved out of the rocky slopes. Up to about 3,000 metres above sea level the climate permits farming. Most of the cash income for villagers stems from tourism, many of them work as tour guides and carriers for the trekking industry. With such a trekking started Ramon's work in Nepal. Together with Ram, the project director, the Nepali architect Rajezh and three members of Gecotec they started on a rainy day in the capital Katmandú. After several hours in bus on windy roads it was a two hours walk up and down mountain sides, stepping over large rocks and climbing stairs. The support team, a group of locals, went ahead, carrying tents and food, and when the group arrived they could take a rest in the “dining tent” and then go into their own tents to change into dry clothes. The first workday started without rain and with a full breakfast served by the support team. Then it was to climb up the hill to visit the damaged water catchment for the village. On the way we saw destroyed houses that had been partly rebuilt, but also some that came almost unharmed through the earthquake. The local buildings are always made of rocks, sometimes with clay mortar, but often dry walls made just of rocks. What sounds weak is in reality quite strong if common masonry techniques are followed, basically using large rocks to make strong overlaps in the corners. Later in the day the village committee officially welcomed the visitors in the traditional way, placing flower chains around their necks and colourful cloths with good wishes printed on them. The old school has been cleaned up and the rocks are nicely piled up, ready to start construction again. Next to the old school stands a community building that was built according to the standards for adobe buildings ! Stone walls 45 cm thick placed in clay mortar, buttresses in the corners and concrete tie beam on top of the walls. It is the same model that EcoSur has been promoting for 40 years and that has recently become legal standard in El Salvador, but here it is with rocks instead of adobes. As a fact, this was built by the government, using national building standards for “low strength masonry” dated 1994. The new school is planned on the same principles. Ramon and Rajezh are now back in Kathmandu and are preparing the plans for the construction permits to be granted by the Ministry, the local authorities and the village committee. 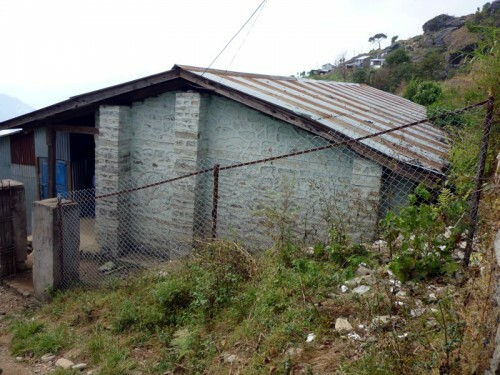 Then Ramon will go back to Bhorle and start construction of the school and also repair of the damaged water system. He treasures this new experience in the mountains, with winter and snow coming soon. It is a welcome change from his last foreign assignment in Haiti where he spent almost three years in another earthquake reconstruction.